This is one I’ve been holding back in reserve for when I had a "frantic" day. If I ever had one, yesterday was it. So I've dug it out, dusted it off, and now offer it to you. This is a good one for Christmas or birthday presents. It makes a great gift for any aspiring or inspiring chef on your list. Do you remember a few weeks ago when I was bemoaning my fate after buying a 5 lb. box of fresh Nova Scotia blueberries? What to do… what to do... Well some of them fell into vinegar. This is so dark purple it is amazing. In actuality, it looks so close to blueberry juice concentrate, except for the thickness, it’s not even funny. 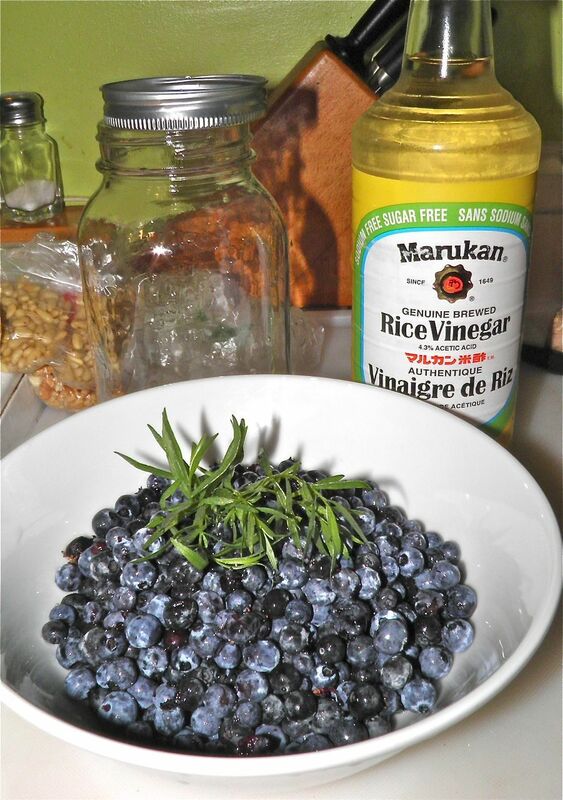 And the taste… the blueberries are definitely present, the tarragon adds a hint of herb and the rice wine vinegar is nice and sharp. It's quite a combination. This vinegar is literally bursting with the aroma and flavour of Nova Scotia wild blueberries! 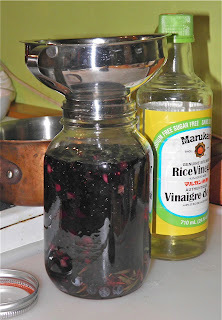 It would be a wonderful way to add zing to a vinaigrette or as a finish for many a fruit dessert. 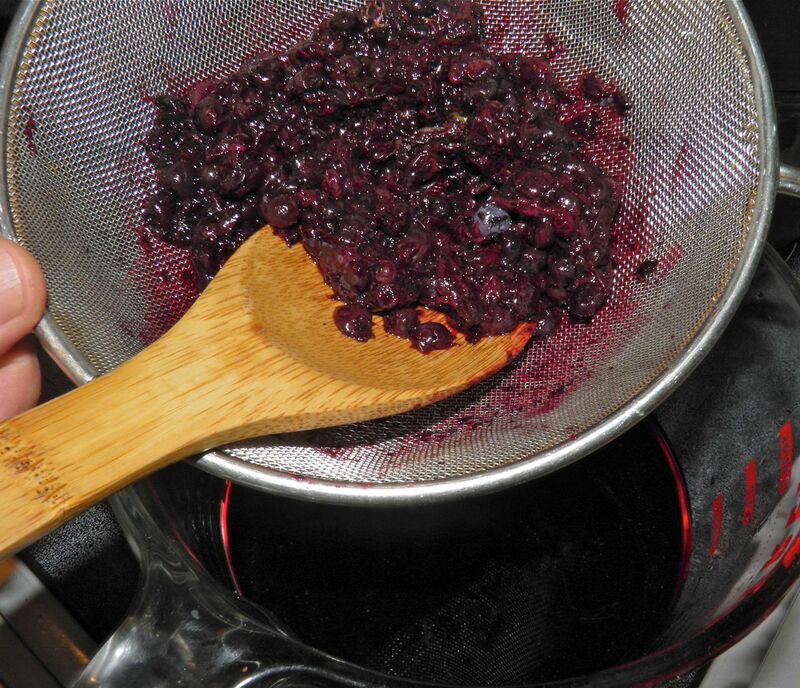 Blueberry vinegar is also perfect for marinating game or beef, drizzling on carpaccio, or adding to fruit reductions. I wouldn’t hesitate to call this vinegar a gourmet treat. Did you know that a bottle of fruit vinegar, depending on type and size, could cost upwards of $50 per bottle? This recipe is substantially less, probably racking up a total of maybe $8 for two 375 ml bottles—including the bottles. Perfect bottles can be purchased inexpensively at "noble grape" on Quinpool Road, Halifax, or check your local wine kit store. There is no reason on earth why you couldn’t use frozen wild berries in this recipe. Just thaw out the requisite amount and add them, with whatever juice that collects from thawing, in the same way stated in the recipe. This is so easy and such a nice gift you may want to double or triple the recipe. Clean the blueberries and wash the tarragon leaves. Pat both dry with paper towels and place in a sterilized 1 L mason jar. Heat the vinegar and sugar just until boiling. Pour over the blueberries and tarragon. Seal and let steep for 2 weeks. After steeping press the liquid from the berries and strain through a cloth to remove all the solids. 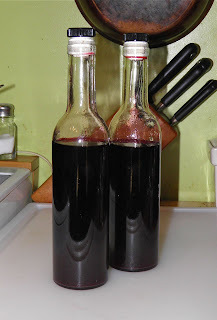 If you want your vinegar to last for more than a few months you have to pasteurize it. Use a thermometer. Heat the liquid in a saucepan to 170°F. Keep the vinegar at this temperature for 10 minutes. Bottle in clean sterilized containers with well fitting tops. Keep out of direct sunlight. Your vinegar will last for several months if not a year. Refrigerate if you have any concerns at all. Besides the uses listed above, a good idea would be to make a vinaigrette (3 parts olive oil to 1 part vinegar) with some pepper. It’s great drizzled on white fish such as halibut or haddock. *Rice wine vinegar has a different taste that regular white vinegar.